I received a copy of Use Your Words in exchange for my honest review. All opinions are my own. You see, I recently took a job with Hand to Hold as their Lead Blogger for their official blog, Preemie Babies 101. There, I manage the team of writers, host Facebook chats, manage the social media of the blog, and more. I love it – it’s definitely something that was meant to be. But, I don’t get to write as often – and that part – that part I miss. So, I NEED to be here. In this space. Using my words. To heal. To help. To honor. 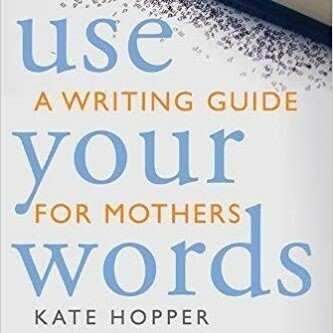 I recently had the opportunity to review the book Use Your Words: A Writing Guide for Mothers, by Kate Hopper. Kate and I met when she got involved with the Celebrate Carter fundraiser I hold yearly to honor my lost triplet. I’ve been lucky enough to pick her brain and read her other book, Ready for Air. She even agreed to work with me as a guest on Hand to Hold’s monthly Facebook chat for March, and it was a hot topic. So, as I return back to writing on my blog (however sporadically it will have to be now that I’m back to working), I want to share WHY it’s so important. Did you know that there is scientific proof that writing is helpful? Even if there wasn’t that, I would be a testament to the fact that it surely helps me. How? When I don’t write – like if I’ve gone too long between writing – I am more irritable, more anxious/depressed, more likely to be on edge and let medical issues get out of hand, and not quite as much fun to be around. Just ask my hubby. But when I write – when I let the words flow – it calms me. Brings me back to center. Kind of like praying does. It’s therapy on paper. And I love it. In Kate’s book – part writing guide, part personal example, and part case study – she walks the reader through the power of words. Specifically, how mothers can tap into their unique perspectives and be taken seriously when they do write. Each chapter has a focus – either bettering the craft of writing in general or a focus on a topic specific to mothers. While you can skip around to any part of the book you feel is needed for your situation, the book also follows an order, building upon previous chapters. And it’s not all about Kate and her experience as a writer either, although she does teach classes on writing. There are many examples from other mom writers – whether well-known or random stranger. This adds a unique aspect to the book, because it gives the reader a wider sense of writing in general. Use Your Words also throws in lessons so readers can practice Kate’s tips – I think this would have been a great book in college English! The stories are heartwarming, the exercises thought-provoking. Did I like all of the exercises? No. Some weren’t for me. But this book wasn’t written for just me, and not everyone is in the same point in their journey. I like how Kate was able to fit in a multitude of stages, and I particularly benefited from the chapters on taking your writing to the next level (think: books), since that’s where I currently reside. Some of these chapters could even be transformed into their own mini-books, but Kate doesn’t shortchange you on what you need to know. My favorite ‘lesson’ chapter was the one on humor. I already use this device in my writing, but I loved seeing her take on it and why it works. Using humor in your writing can be a powerful tool – an effective way to communicate feelings and to write about topics that are generally unacceptable in the mainstream. Humor lessons the blow, makes hardships and heartbreak, and of course anger, more palatable. Yes. Like the death of a child. Like infertility. Like prematurity. Like abuse. I’ve covered all these topics, and I try to do so in an uplifting, humorous (read: sarcastic over here) way while still being informative about the message at the same time. It’s a fine line. Especially when I’m still in the process of healing and feeling and identifying my thoughts. I added a lot of humor to my first eBook too. Beating Bed Rest shares some not so fun moments in a funny way and tells bed resting moms what it will really be like. To me, that was crucial to the situation if anyone is going to survive bed rest. But, it’s important to be real, too. To take it seriously; not worry about the funny. Words can heal – you and your readers. One of Kate’s first exercises revolves around memories, sensory details, moments in time. Those exercises help you take your memories and shape them into power. Doing so gives them the power to heal, help, honor. It’s exactly what I did in this post about holding Carter for the last time. I appreciated Kate’s book for many reasons and I love that it was targeted to moms – an audience often discarded as simply journaling housewives. Any writer – from beginner to published author – can benefit from this book and Kate’s insight. And even if you’re just journaling to get the words out, this book is for you. Learn more about Kate on her blog. Thanks for the chance to win a copy of Kate’s book, Angela! I’m really looking forward to reading it! loved reading this blog post and would love to read Kate’s book. reminded me how important getting back to blogging is! Love this very personal post by Angela! Can’t wait to read this book and get on board writing again! !